Yorkies are making themselves at home in the new Sr. Building. Here’s some of the girls enjoying the lounge areas – for clubs, homework or eating lunch. School Reach Trivia has been using the media lounge during the lunch hour – no more sitting on the floor in the science wing! Mr. Ruse put the Sr. Volleyball team through drills on Wednesday night. I’m sure the girls are very happy for that grand staircase. Well, at least there is no more trekking out to UBC for stairs! And finally, here are some of our younger Yorkies checking out the names on the glass panels. 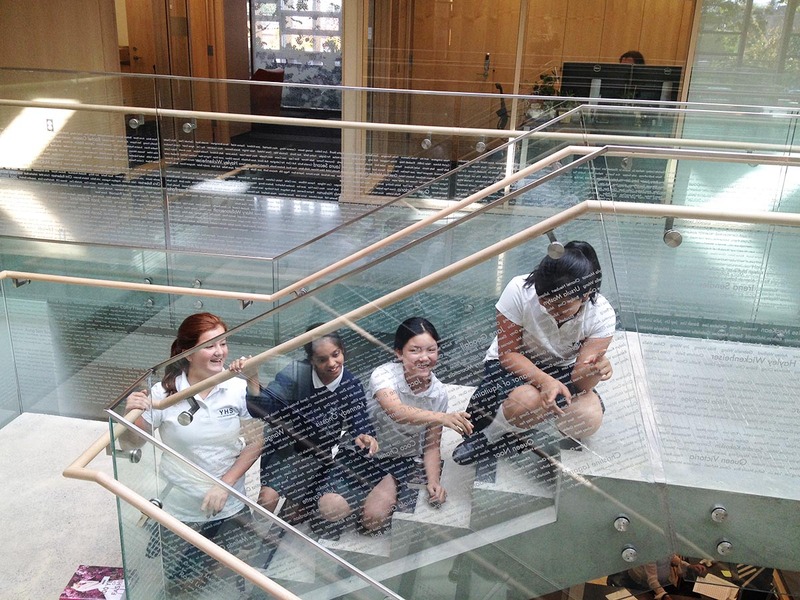 The glass panels around the staircase spotlight 102 notable or inspirational women, both past and present, as well as YHS alums, honourary alumnae, the seven Founders of YHS and all our current students.